Earlier this month, Amy Gillett Foundation chairman Mark Textor was joined by 29 riders, including Tour de France stage winners Brad McGee and Phil Anderson and Commonwealth Games road race champion Rochelle Gilmore, in spreading the message of cycling safety during the annual Amy’s Share the Road Tour. A major fundraiser and a great opportunity to raise awareness, the name of the tour is derived from our philosophy that we all need to share the road to achieve bike rider safety. AGF board member Rod Katz shares his experience from this year’s tour. Assembling at Rydges Cronulla on Sunday afternoon, I find a bunch of people almost as nervous as me, as well as the veteran tour riders. We bring our bikes into a room on the mezzanine level where Sean the very friendly bike mechanic gives them a once-over. We also collect our kit. There is a system and the old hands share their knowledge with the first timers. Immediate rapport with Margaret who had heard of me from Ange. Margaret models the kit for us and we agree that Sub4 has done a great job. Justin, from Sub4, joins us on Day 2 and we can give our feedback to him directly. Of course the first impressions of super-comfy bib and knicks need to be retracted at the end of the tour but that is really not Justin’s fault. There is only so much a bit of padding and an ergonomic cut can do. Drinks and dinner offer a chance to make more connections. There are a number of people on the tour who are integral to the cause. Foremost of course Mary and Denis Safe, Amy’s parents, are living talismans of the values of the Foundation. Consideration of others and decency is just who they are. Mary is also a very eloquent speaker and skilled presenter to any audience, from primary school students to government ministers. Formalities include short addresses from Mark Textor, our Chairman, who articulates the mission from his heart. Also pleasing is the participation of representatives from some of the key AGF sponsors and supporters: Mal and Brett from Toll; Anthony from Saxo Capital Markets; Adam from Wiggle, Matt from High5; Nathan from Subaru; Justin from Sub4. 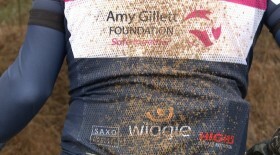 It is one thing to sponsor an organisation, but you know that they mean it when they literally come along for the ride. Monday morning we nervously set out from Cronulla as one group but the first technical descent of the tour (Waterfall) signalled time to split into two. The “Jens” group have a desire to endure as much pain as possible while the “Ulrich” group are sensible people with a life that does not regularly involve 30 hours a week on a bike. You can probably guess that I’m a loyal member of the Ulrich group – also known as the “fat bastards”. We pride ourselves on enjoying the scenery, lively conversation and a willingness to open up about our personal afflictions, ailments, disappointments, weaknesses and failings. We are never short of material to work through. Fortunately, some of the pro’s are willing to mingle with us and keep us from descending into complete mental and physical disintegration. They inspire us and instruct us – thanks Brad, Phil, Stephen, Rochelle and Rachel!! Once we are in our formations on Day 1, we start to really enjoy the scenery. The weather is perfect for this day. The ride through the Royal National Park is sensational and then we emerge to the views of the coast and paragliders riding thermals on the cliffs. The first school stop at Thirroul is outstanding. The kids want to know everything about the equipment. They are voracious autograph hunters and serve wonderful platters of fruit for morning tea. The rest of the day involves a tour of the ‘Gong, Dapto and then onto the climb up Macquarie Pass before a cruise on to Fitzroy Falls where we avail ourselves of the hospitality of the McGee family. Cato the cook prepares a meal with just the right balance of protein and carbs for hungry cyclists. The carnivores drool over the pig on a spit. After dinner, Rach Neylan takes the microphone and interviews the McGees about their early romance and life on the road – hilarious and revealing. With another extraordinary culinary effort under our belts at breakfast we clamber on our bikes at 9 and start riding. Before we know it we are swooping down into Kangaroo Valley in the company of hundreds of BMW motorbike tour riders. It is very pleasing to share tandem wheeled camaraderie with them. The climb back out of Kangaroo Valley soon has our legs thinking back to the Macquarie Pass experience of the day before – fortunately the climb isn’t as long and there are a couple of places where we have to stop for roadworks. These give us a nice breather and opportunity to all come back together. The descent into Berry is quite hairy and we’ve been warned about the need to take it easy as the pitch increases at the bottom while the road surface morphs into a series of corrugations and pot holes. Berry Primary School awaits us and we enjoy a chat with the kids and then morning tea. It is only about 50km from here to our finish point of the day at Huskisson but it is probably the busiest section of road that we are on all tour. Fortunately, the message is getting out and we are allowed lots of space. Arriving at Huskisson, it is hot and the beach beckons. Last chance to voluntarily get wet outside for the next little while. Some of us have the energy to take advantage of it, Matt from England is particularly keen. Overnight the wet weather has arrived. A gentle drizzle as we make our way to breakfast at the cafe up the road – excellent fare dished up by a cycling cafe owner. Before long we are on our bikes and after about 15kms we hit our first dirt. I’m soon sliding around on slick mud as the rain turns the gravel into a big brown banana peel. My limited bike handling skills are put to the test and I’m super cautious at the same time as I’m telling myself to “relax!”. At the end of this first section of “Strada Bianchi” we are all wet, filthy and cold. Fortunately we have a long steady climb to warm up. This is pretty good road but the rain keeps coming and the trailer-trucks whooshing past send up bow-waves of dirty water – intimidating! By the time we get to the top of the range, we notice a slight clearing in the weather and a complete change in the flora. It is still a long haul to lunch at Nerriga and by the time we get there we are very pleased to see civilisation, even if it does involve one pub with an array of utes out the front mingling with the free ranging Isa Brown* chickens. * Interesting fact: Isa Brown chickens get their name from the company that developed the hybrid – Institut de Sélection Animale. With our jackets on and bellies full, we continue on towards Braidwood – rain, mud, mud, mud, asphalt! The final run into Braidwood sees a whole new understanding of “frame of reference” – the dead, potholed road feels wonderful compared to the mud and rock. We get in just as school gets out so we miss the school visit but gratefully get into showers wearing our kit to get some of the mud out before putting it in the wash. The process takes a long time as brown water keeps coming from knicks, socks, shoes and jackets. The bathrooms bear the traces of Deua mud. The colonial streets of Braidwood are pretty and quiet. The pizzas are great and we are soon snoring. Day 4 sees a new face in the group (hello Stephen Hodge). He has plenty of opportunity to share his great experience of bike handling in difficult conditions. After a wonderful first forty-odd kilometres to Majors Creek along good road and beautiful scenery, we re-familiarise ourselves with gravel. The rain persists through the morning but we are fortunate in having a mainly uphill ride during the wet part of the day. The canopy of trees over the road is spectacular as we climb through the Deua National Park. It is temperate rain forest and the weather is particularly conducive to leeches. Matt, our English guest, is the one who picks up the leech and confirms the reputation of Australia as a land of nasty creatures. At the top of the climb (elevation 1263m) we huddle in the bus to have a shivering lunch. Rach, Kathy, Alyce and Kate are wonderful – they make warm coffee and spicy wraps. Starting off again is hard as we have a muddy downhill stretch to contend with. Rochelle has shown us how tricky it can be to make a sudden move after lunch as her cyclocross-inspired leap onto the bike ended up as a face-plant in the mud. Fortunately, the rain does ease off and we eventually hammer into Cooma. The Bunkhouse motel is a quirky place with absent management. The mud removal process seems easier today and we are soon enjoying a great dinner at the wonderful Roses Lebanese restaurant. Stephen pretends to interview Phil Anderson, but Phil pretty much takes over and recounts great stories of run-ins with Bernard Hinault and the naiveté of a lad from the Peninsula cracking the big time in European cycling. I’m signing up for the book. Did I mention that this is the best meal I’ll have until breakfast the next day at the Lott? I’ll need all those calories to get through to Tumut. The good news about the day ahead is that it is all on sealed road. We start off with a moment of silence for Jim Chant who was killed recently while on an Audax ride –thinking about him, his family and friends, gives an important perspective on why we are out on the roads this week. Unfortunately we lose a few riders from the group today due to other commitments – Phil, Rochelle, Nathan and Matt have commitments at the Cycling Australia Awards (where Phil is inducted into the inaugural Cycling Australia Hall of Fame – what a great ambassador for cycling and the AGF he is) and fellow board member Dimma has work and family needing his attention. It has been an honour and privilege to ride with these people and we miss them. The adage about strength in numbers certainly applies on a day like today. The exit from Cooma is hard. The first 30kms seems to take forever with a grinding climb and shifting headwind making it tough on the pair at the front and difficult to find the sweet spot in the peloton. Hodgey’s relatively fresh legs and years of muscle memory are much appreciated as he takes long turns. By the time we get to Adaminaby we are pretty spent, but a nice little rest and rehydration, re-application of chamois cream (thanks Chairman!) and we feel ready to take on the next segment. There is more steady climbing as we really start to feel we are in the alps. The mountain environment is emphasised by a hail storm and sharp drop in temperature. We pass Kiandra and enjoy lunch by a mountain stream at about the 110km mark – only 70km to go! This is a bit of a blur up until we get to the big descent down to Talbingo. What a rush! All of a sudden we only have 30km to go and we think “We can do that on one leg”. The drop from 1400m down to 400m has changed the temperature dramatically and we drink, drink, drink. It is hard and fast into Tumut as we feel the pressure of time. Even so, us slow riders don’t get in until past 6pm. A shower and dinner beckon and a massage for those brave enough to yield to the probing fingers, hands and elbows of Alyce and Kate. The pub is a five minute walk and that provides a nice stretch for the legs. Despite deep exhaustion, sleep doesn’t come easily. For the first time I have a room to myself. At midnight I have another shower to remove the traces of grime that weren’t dislodged at the first attempt. After fitful rest, the alarm goes off at 6 o’clock and the final breakfast beckons. It’s a buffet fortunately and I pile on the eggs and beans as well as muesli. The ride today involves a bit of uncertainty. We take one false turn, retrace our pedal strokes then confront a steep climb. The sign that says “Dirt road to Wee Jasper 64km” surely could not be right? Actually it is right. But the road is in pretty good condition and by 2 o’clock we are enjoying lunch at Wee Jasper. Of course we still have a long way to go to Canberra and this is a problem. In our total focus on survival, we did not think about the welcome reception scheduled for 5:30pm or the arrangements to meet (ACT Transport) Minister Shane Rattenbury at Uriarra. Fortunately Chris has joined us at Wee Jasper. His legs are needed on the front to set a fairly fast pace back to Canberra. We finally get back within phone range by 4:30ish – we let the folks know about the delays and hope the fast group can take care of formalities. We pedal on as a bunch with a great spirit of mutual help. We conquer the Three Sisters out of Uriarra then go as hard as we can for the hotel. Arriving just a little past 6pm is actually a great effort for a very long day. The reception at the Realm Hotel has been superbly organised by AGF board member Jane Seaborn. Vida has made an amazing “pigs in mud” cake reflecting our experience over the week and themed the room. Jane makes a wonderfully moving introductory speech and this is followed by addresses from Tex, our new CEO Phoebe Dunn and Shane Rattenbury. These speakers pull it all together by identifying the value of the input that the AGF provides in policy and promotion, the progress we are making, and the support out there in the community. So, what a wonderful experience. The knowledge that collectively we have raised over $130,000 for the Amy Gillett Foundation warms the heart and is well worth the pain in the legs. Sharing the experience with some of Australia’s greatest cyclists, as well as old and new friends also created lasting memories. The question remains – how do we take the Amy’s Share the Road Tour to new heights? Having been a debutant it is clear the Amy’s Share the Road Tour has huge potential to do even more for our vision of zero bike rider fatalities. To achieve that we will need more riders which will also mean matching the Tour route to the ability of the average rider but one that still keeps the fitter and faster happy. We can make more from our passage through the regions by better engaging with local media and community leaders, police and others. And we need to take some of the load off Mary and Denis Safe whose commitment to remembering Amy and spreading the message of bike rider safety is unsurpassed. The personal visits they make to the schools are wonderful but we need to plan for the future and relieve some of the burden. Without more riders there will not be the financial surplus to allow the community engagement and make the most of the PR / education / awareness and behaviour change opportunities the tour provides. What a wonderful seven days and thanks to all who helped make it happen. The cause of road safety, and especially safety for bike riding, is very close. Amy was a wonderful friend to our family. I did this ride on the 10th anniversary of her death and it has a special meaning. Our daughter, Jo, was a flower girl at Amy’s wedding to Simon Gillett. Vida and I enthusiastically took part in the dancing… We miss her still very much.